Made to Move in Every Way You Do. 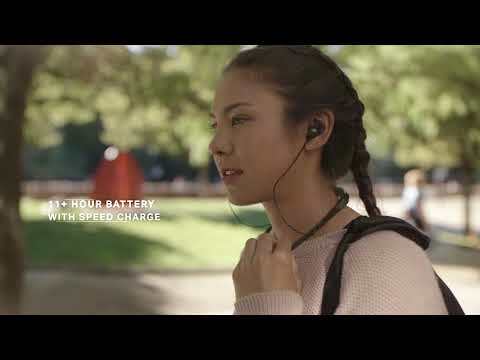 UA Sport Wireless Flex – Engineered by JBL is rated 3.9 out of 5 by 45. Rated 5 out of 5 by Luke85 from The best I've ever owned The sound quality is excellent. I work in a loud environment and all other headphones I've owned were hard to hear even in max volume. I can keep these at halfway and hear perfectly! Rated 5 out of 5 by TonyN from Great sound and volume! I received my Under Armour JBL Sport Wireless Flex Headphones the other day and I've got to say I'm impressed! They're lightweight, easy to use and the sound quality is excellent. I've found other headphones to be lacking in the sound dept., requiring that I have to keep them in the max volume position - but I was surprised that these headphones allowed me to listen to my workout music at the halfway mark! This is a luxury I've never before experienced. Rated 5 out of 5 by javarican from Headphones for daily wear AND for your workout I normally listen to podcasts and music while running. While I have owned bluetooth headphones before, they rarely last long enough to get me through a long run. This makes them quite convenient for my weekday runs, but always forced me to use wired headphones for those long weekend workouts. I was a bit skeptical when I read the promise of a 12 hour battery life on the UA Sport Wireless Flex headphones and I am very grateful to be given the opportunity to review them. The headphones feel well built and have a satin texture on the neck piece. This textured finish helps while working out, as it stops them from slipping around on your neck. The ear-buds are magnetic and you can join them together to keep them from flopping about when not in use. Great touch. They are slightly flexible and can be molded around your neck easily. I honestly forget that I’m wearing then during the day. The buttons are easy to find with raised textured icons for play, pausing, plus and minus for the volume. They are pretty intuitive and you can easily get going without reading the manual. The only thing that you’ll need to read to figure out is how to turn on my favorite feature on them… the flashing LED light on the back of the neck piece. This is a seriously bright light, which helps for visibility when running at night. Not blindingly bright, but plenty to keep you from being invisible. Great design overall. As far as the charging and battery life… I can generally charge them fully in about 30 minutes and I have yet to kill the battery. I use them all day during work and go straight from there into a workout without any issues. I seriously think that they would outlast my phone and I have no reason to doubt the claimed 12 hours. The only thing I would add would be an indicator of the remaining battery life. Who knows, maybe the bluetoot light changes colors when the battery is close to dying, but again I haven’t even been close to killing the battery to know. As a whole, these are seriously brilliant headphones, with the great sound that you can always expect from JBL products. These would be a great choice for anyone wanting sturdy headphones that will survive a workout and don’t look out of place for daily use. Great product overall. We would like to work with you directly and get more information to help you with your issue. Please submit a case request at https://www.jbl.com/support-contact.html and the Customer Service Team will be more than happy to assist you. How much the headphones weigh??? This product weighs 318 grams. The UA Sport Wireless Flex has an IPX5+ rating which makes it resistant to sweat and moisture. Is it normal for the red light to go off after a few minutes while it's plugged in to charge? How do I know how much charge it has? The UA Sport Wireless Flex headphones has an LED indicator near the volume control buttons, where it would start blinking red once the battery charge goes low. There is no way of knowing the exact charge of the headphones, but if you start charging your unit, the same LED indicator with show a solid red light, and will go off once the battery has been fully charged. Does it have caller name announcement feature? If not please suggest product with the same feature. Thanks. Thank you for your question. The JBL UA Flex does not have caller name announcement, but you can manually activate Siri and speak into the microphone and have her call the contacts in your phone. If you require further assistance,please submit a case request at www.jbl.com/support-contact.html and the Customer Service team will be more than happy to further assist you. What are the three options of the LED lights? Different color? Flashing? What is it? Hi! The UA Sport Wireless Flex has a&nbsp;RunSafe mode.&nbsp;It is an LED indicator to keep you safe if you are walking or running outside after dark. When you press the microphone button (located on the LEFT arm) to enable the RunSafe mode feature. The first mode blinks continually. When you press the microphone again, the second mode is initiated which features 2 blinks on followed by 2 seconds without. Pressing the microphone again is the third mode which is 3 blinks on followed by 3 seconds without. Could I know the exact size of headphone (mm) and power consumption? This information can be seen in the products specs. Is there a way to reset the headphones if they won't turn on and they are fully charged? Mine had stopped working and I've only had them for about a week and a half and I would really like to continue to use them.